A stunning all round performance from younger Blackwell sibling, Harry, led M & B to a surprisingly convincing 5 wicket win over regular adversaries, Dave Smarts X1 on Sunday. Captain for the day, James Bowler, was surprisingly cheerful, despite informing his team mates that he had lost the toss and three hours in the blast furnace was awaiting them. Smart's X1 got off to a rollicking start with 13 coming off the opening over, an edge here and there together with some blistering drives, as Alkesh Vaja failed to find his rhythm. Harry Blackwell found a full off side line and length from the word go and was unlucky to find the edge and go to the third man boundary in his first over. Although Vaja found the pace and knocked keeper Hess back a few times, along with his glasses, he continued to leak boundaries, forcing Bowler to remove him from the attack after three overs as Smart's X1 raced to 43 off 5 overs. Vaja was replaced at the River End by reluctant left arm seamer, Benny Howard, who found a controlled line and length straightaway, courtesy of his controlled run up. Blackwell continued to hit a full off stump line and was rewarded in his 5th over with the wicket of J Langham for 11 as Smart's X1 posted 50 for their first wicket in the 10th over. The wicket brought Starvin Bhavin Vaja to the crease, the first of the two Vaja clan, guesting for the opposition. Bhavin was off the mark third ball as Blackwell surprisingly strayed onto leg stump and the flicked to the unguarded fine leg boundary for four. Blackwell made the key breakthrough in his 6th over as he dismissed the dangerous G Langman for 37, courtesy of a stupendous caught and bowled. Scooping a well struck drive just off his boot laces one handed in his left hand on his follow through, leaving everyone dumbstruck. Despite playing very little over the last couple of years Bhavin played himself in, with his dodgy sounding bat, before starting to open his shoulders. Senior Blackwell, Louis, replaced Harry at the Road End and settled immediately, finding appreciable turn and bounce. After a couple of overs though Bhavin got his number and hoisted him over mid off for 6, as the batsmen began to get score more freely off Blackwell. Howard was replaced, after a fine six over spell by Thomas Noakes, who after two tight opening overs was then hit to leg by Murphy for a number of boundaries. The 100 was brought up in the 22 over by Smart's X1, which was a plus for M & B as the score had stood on 43 after 5 overs. Still Bhavin and Murphy were starting to build a handy partnership as Bhavin started to score freely off Blackwell, striking another 6, which just eluded Bowler on the deep mid on boundary. Jono Wright got the next wicket as Wright was caught behind as he tried to drive at the left armer's angled ball across him. Armstrong replaced L Blackwell(8/1/44/1) and his first ball full toss was dispatched to the midwicket boundary to bring up Bhavin's 50. He repeated the dose two balls later and was glad to bowl at new batsman Jackson for the last two balls of his over. Jackson obligingly drove his second ball to the imposing figure of H Blackwell who caught the catch two handed, diving to his left. The players retreated to the boundary for the second of their drinks breaks with Smart's X1 on 159 for 4. Bhavin made his intentions known first ball after the break by whipping Wright's straight full length delivery onto the practice netting over widish midwicket for 6. Wright quickly exacted revenge by having Bhavin caught behind as he tried to cut a ball, leaving him walking back to the pavilion for a well compiled 63, made in 20 overs, which contained 5 4's and 3 6's. The majority of the run scoring in the latter overs was left to Thomson, who smashed a quick fire 33 in 7 overs, notable for dispatching Jono Wright over the River net twice for 6. Although Smarts X1 score 71 off the final ten overs, 230 for 7 off 40 overs was at least 20 short of a par score, with the lightening outfield. Harry Blackwell had the standout figures of 7/1/22/3, well backed up by Jono Wright's 7/0/35/3. Skipper James Bowler excelled in the field, and took a number of blows to the body whilst continually fielding drives at mid off. Tim Smart kindly let Will Cunliffe open the batting, despite only fielding for 10 overs in the M & B innings. Perhaps still suffering from travel lag, Cunliffe got a delivery which lifted from Jackson and was caught behind in the 3rd over with 9 on the board. Alexander Hess and Benny Howard laid the foundations for the M & B innings by posting 50 for the second wicket. Hess started slowly but then began to work out Master Vaja's cunning yorkers, by batting well outside of his crease. The result a 6 over widish mid off followed by another driven boundary. Howard rotated the strike well and scampered between the wickets, between the odd driven and cut boundary. Hess was next to go for 30, caught by skipper Smart at mid off to leave M & B59 for 2 in the 11th over, with the game evenly poised. Monsieur Le Clerq was next to enter the fray, after a few dot balls he unfurled an off drive for 4 followed by a pull to the square leg boundary next ball, as the bowler pitched short. After that appetizer the main course was rather a let down as Monsieur Le Clerq edged Hughes to Starvin Bhavin at first slip, who pouched a good catch. This brought Matt Hayden look alike Harry Blackwell to the crease and he quickly went about rotating the strike as his commanding presence at the crease, with his bat held aloft, exuded confidence. He deposited spinner Langham for a 6 and a 4 in his first over. Blackwell put on 35 for the 4th wicket before Howard was bowled for 32, trying to make room to hit on the off side through the covers to the persevering Hughes. 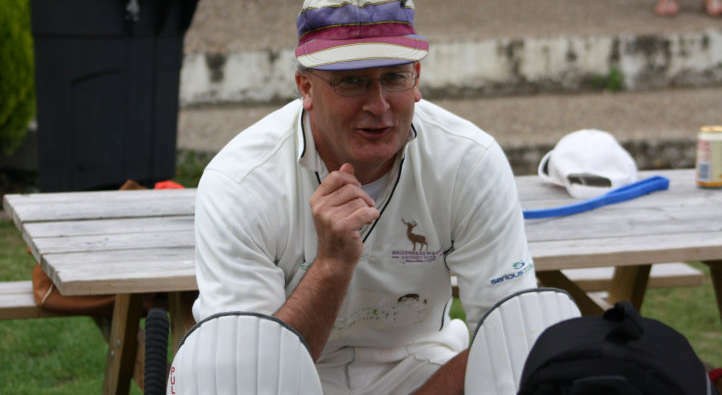 The wicket brought the elder Blackwell to the crease with the game evenly balanced at 110 for 4 in the 20th over. Louis was actually the more dominant in the short partnership with is brother as he was quick to pull the short ball against the spinner and pounced on an over pitched ball to deposit to the cover boundary. Louis played across the line at the spinner although appearing well forward and was given out by fellow player Jono Wright, leaving Louis walking off shaking his head for 19. His dismissal meant skipper Bowler appeared at 7 with M & B ahead at 141 for 5 in the 23rd over, needing to score at marginally over 5 an over for the remaining 17 overs, which was well within their capabilities, with H Blackwell still at the wicket. By now Harry was scoring at will all round the wicket. With M & B waiting for strike bowler Tim Smart to appear, to their relief this never happened as Smart decided to bring on a few lesser bowlers, who were dispatched to all parts by Blackwell, mainly straight but also over widish mid on as the target came tumbling down. Two straight sixes off G Langman meant the scores were tied as Harry brought up his 100 with his 5th 6, to go with his 9 4's. It was left to Bowler to loft the first ball of the 33rd over mid-on to bring M & B victory by 5 wickets, courtesy of a commanding all round performance from Harry Blackwell, probably too reliant really. Skipper Bowler remained undefeated on 17 as the 6th wicket put on an undefeated partnership of 93 in only 10 overs. Hughes and J Langham were the standout bowlers for the Smarties.